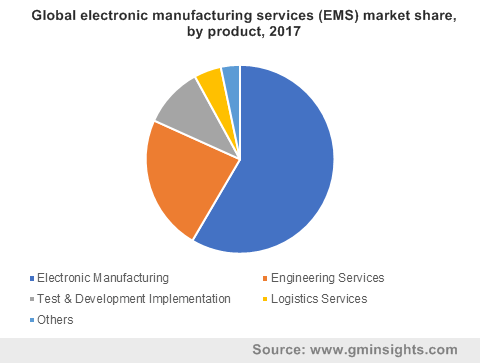 Electronic Manufacturing Services (EMS) Market size was valued at over USD 450 billion in 2017 and will grow at a CAGR of over 5% from 2018 to 2024. 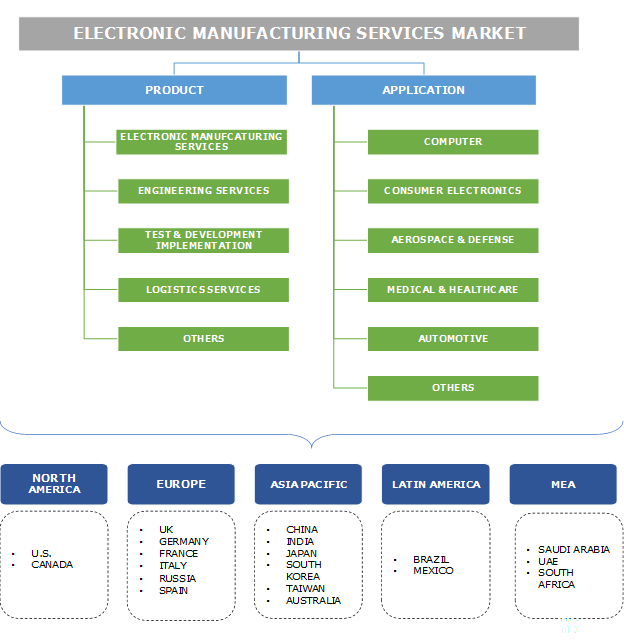 The electronic manufacturing services market is mainly driven by the increasing outsourcing activities by electronic OEMs across the globe. EMS providers offer highly efficient and cost-effective solutions to the OEMs that aid in saving the production and operational costs. It helps manufacturers to capitalize and focus on their core competencies. With the growing industry competition and continually-evolving technological changes in product manufacturing, OEMs are enforced to avail manufacturing services that further drive the EMS market. These outsourcing activities benefit service providers as they can easily offer their products to the market, strengthening their regional presence and achieving advanced engineering capabilities. The introduction of smart factories and industrial automation to the electronic manufacturing services market account for the operational development in service providers landscape. Smart factories allow providers to achieve efficient machine-to-machine communication. By integrating smart factories and IoT, production machines can communicate through the cloud computing platforms. These communications allow service providers to achieve a high quality for mass production and eliminate the issues due to complex machine specifications. The trend of automation in the services market reduces operational costs as maximum operations are performed by robots and machines, which limit the human intervention. A major factor hindering the electronic manufacturing services market is not being able to cater to the huge industry requirements due to the limited supply of raw materials and components by the suppliers. A shortage of raw material availability occurs due to the increasing demand across various industry verticals and concerns regarding environmental hazards. As a result, suppliers provide products to their customers and key manufacturers. The shortage can be also attributed to continuously-fluctuating component prices. The issue can be overcome by maintaining long-term relationships between suppliers and OEMs, facilitating the continuous raw material supply at reasonable prices. Test & development implementation services are gaining popularity and growing at a CAGR of 5% owing to the increasing quality & safety guidelines applied to product manufacturing, fueling the electronic manufacturing services market growth. Several governments across the globe have adopted stringent guidelines and regulations for electronic product manufacturing. For instance, the CCC mark is China Compulsory Certificate that is applied as a safety mark for several products to be imported, sold, and used in China. To meet the legal requirements and achieve high-quality manufacturing, OEMs deploy these services from EMS providers. These companies offer agency compliance, laboratory, environmental, and functional testing of the electronic prototypes prior to the implementation in main products. The logistics service segment in the electronic manufacturing services market will observe a steady adoption due to the speedy product delivery requirements across the globe. Key consumers of these services include consumer electronics, computer, medical & healthcare, and automotive industry players. OEMs are increasingly investing in the logistics services to offer fast delivery to cater to customer demands and achieve a competitive edge. The demand for these services is attributed to the improvement in the logistics and transportation services by EMS providers and the elimination of high costs involved in these activities for OEMs. Logistics services are further developing due to the increasing component outsourcing activities by major OEMs and system integrators. Developing contracts for product transportation operations allows companies to maintain an efficient distribution channel, further driving the market growth. Increased demand for the electronic manufacturing services market in the consumer electronics industry, reaching over USD 200 billion by 2024, is due to the increasing demand for consumer electronic devices across the globe. The rise in the disposable income and improvement in consumer lifestyle across several countries including India and China account for a high demand for these products. The high manufacturing cost in the European and North American countries encourages consumer electronics manufacturers to outsource the manufacturing services from other countries such as India, the Philippines, etc. Companies operating in the EMS market offer specific services to consumer electronics manufacturers, who provide connected solution requirements. For instance, Asteelflash offers specific electronic manufacturing solutions including design, prototyping & engineering, mass production, and end-to-end lifecycle for the consumer electronics segment. Medical and healthcare applications in the electronic manufacturing services market deploy these services for developing safe and legally-compliant medical devices. Stringent industry requirements and standards that ensure the safety and reliability of medical devices create opportunities for the medical & healthcare services market growth. For instance, ISO 13485:2016 standard involves requirements for quality management systems related to the production of medical devices and the related services. OEMs need to develop fail-safe and reliable medical products to ensure patient safety and avoid any harmful consequences. As a result, they deploy the efficient services offered by EMS providers that include diagnosis equipment, handheld devices, and testing & inspection for PCBs to finished product assembly. 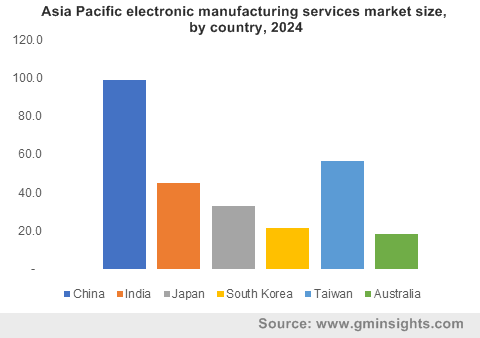 Asia Pacific electronic manufacturing services market is growing rapidly at a CAGR of over 6% due to the increasing demand and production for consumer electronic devices and other electronic components in countries including China and Japan. Companies in the region mainly provide outsourcing services to the U.S. and Western European countries owing to the high demand and low labor wages in the region. Additionally, the supportive government initiatives adopted for infrastructure and technical development of the manufacturing sector further drive the market growth. For instance, the Make in India initiative by the Government of India offers various schemes and provisions for manufacturing companies in various sectors such as construction, electronics, textile, medical, etc. The U.S. electronic manufacturing services (EMS) market covers a major share due to the high demand for automotive, consumer electronics, and computer products in the country. High consumer spending capacity and awareness to use technically-advanced and high-quality products further account for the consumption of the market products. The penetration of major automotive, medical, and electronics manufacturers into the North American region is responsible for the high demand for EMS. OEMs in the region focus on deploying these services to offer high-quality products depending on the consumer requirements. Key players operating in the electronic manufacturing services market comprise Celestica, Inc., Kimball International, Flex Ltd., Integrated Microelectronics, Inc., Foxconn, Benchmark Electronics, Inc., Key Tronic EMS, Venture Corporation, Asteelflash, Sanmina Corporation, Creation Technologies, and API Technologies Corp. These companies offer accurate and efficient application-specific services to the OEMs and develop long-term relations with them to gain regular contracts from them. They develop product development strategies that allow them to offer differentiated services to OEMs. For instance, in January 2018, Flex announced the expansion of its digital health capabilities by launching connected health solutions on the Google cloud platform. The new managed services solutions allow efficient analysis of connected medical devices and ensure the regulatory compliance. The rise in demand for outsourcing services and drive the electronic manufacturing services industry growth. The industry is characterized by the presence of a few service providers offering manufacturing & production, testing & development, logistics, designing, and assembly services. These companies focus on the provision of highly accurate services by training the service delivery executives. Additionally, the market participants deploy smart and connected manufacturing solutions, which allow them to offer advanced electronic components according to the OEM requirements. 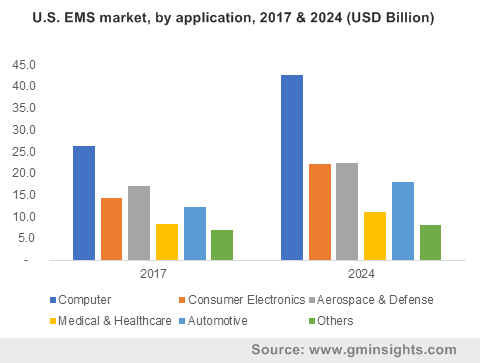 The EMS market comprises players that pose high industry competition and maintain long-term relationships with the suppliers and OEMs.